CAT BACK - SUPPLY and FIT - VAUXHALL ASTRA. Single cat back exhaust fitted with your choice of back box to suit the sound and performance you require. It will take approximately 3-4 hours for your work to be done. Feel free to make yourself comfortable in our luxurious showroom while you wait. Displayed price is dependant on system being in good order as well as additional choices made on boxes and pipes. Fast Lane Styling Ltd specialises in high quality custom exhaust systems. Professionally and individually fabricated at our premises by one of our highly skilled technicians. While you wait at our showroom or drop off and collect. Fabrication times vary dependant on the system chosen and vehicle manufacturers model and year. Choices include, but are not limited to, performance back-boxes, cat-backs, pipe fabrication, and flexis. We offer advice and a full consultation, which includes selecting the back-box, cat-back system, tail-pipes, sound and performance. ALL THE STAINLESS STEEL IN OUR EXHAUST SYSTEMS IS COVERED BY LIFETIME WARRANTIES. The item "Vauxhall Astra Custom Built Stainless Steel Exhaust Cat Back VA3" is in sale since Saturday, August 19, 2017. This item is in the category "Vehicle Parts & Accessories\Car Tuning & Styling\Performance Exhaust\Other Performance Exhausts". 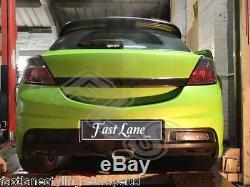 The seller is "fastlanestyling-europeltd" and is located in romford. This item can be shipped to United Kingdom.